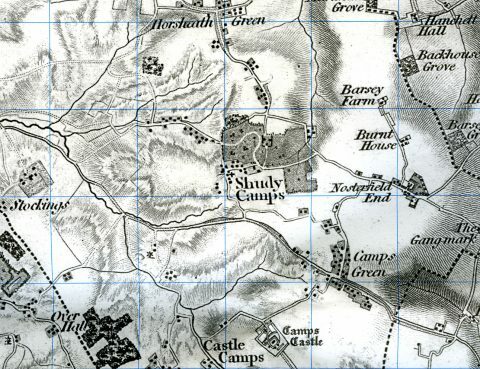 The parish of Shudy Camps lies to the north of Castle Camps and was, until about the 14th century, known as Little Camps. It includes the ancient hamlet of Nosterfield to the east and its boundaries follow mainly ancient field boundaries. It is probable that settlement in the area began in small clearings in the woodland. Early this century the chance discovery of ancient grave sites on the south west slope of White Hills Field (part of Carters Farm) was reported in the “Transactions of the Essex Archaeological Society”. In 1933 it was decided to try and find these burial sites again, in order to date them and subsequently a further 148 burials were found and dated as “the earliest form of Christian Saxon culture” in the area. The skeletal remains were generally in poor condition and were determined to be of 115 adults and 33 children, interred over a period of years. They were distributed in two clear groups, one group with heads towards the south west and the other with heads towards the north west, but with no other particular differences to suggest or confirm that these positions were of significance. It also seemed quite obvious that a now unknown boundary limited the expansion of the cemetery to the south west. On the other side of this imaginary boundary were a number of pits about 2 feet deep, but no further burials or evidence of dwellings was found. T.C. Lethbridge suggests that these pits may have been dug for chalk (hence the later name of the field). cowrie (Cynaea paterina) shells – long recognised as a fertility charm and aid to childbirth. Two complete shells and a number of smaller pieces were found – and these are shells form the Indian Ocean! Head south west. Adult male skeleton, enough remaining of the bones to show that the body had lain on its back with the knees so much drawn up to the right that a notch for them had had to be cut in the side of the grave. The grave had been dug 6 ft long, which was no doubt considered the right length for him by the sextons. He had, however, died in his clothes and had not been straightened before rigor mortis set in. An iron spear-head lay on the right side of the skull, which faces it. On the left side of the skull were two pieces of bronze binding which probably belonged to a wooden cup. His arms were crossed over his middle and beneath them lay an iron dirk with a blade a foot long. An iron buckle lay between the left elbow and hip. Between the right humerus and the vertebral column lay three little plates of silvred bronze, a minute buckle and strap-end of the same material, an iron knife, point upwards, a sharpening steel, and an S-shaped link of iron wire. Two small iron buckles and various bronze studs were found close to the dirk and were evidently part of the scabard fittings. Then follows an analysis of the grave goods and deductions made from their type and presence. In 1086 – there was enough woodland for 12 pigs on one manor and Robert Gernon’s manor supported 16 peasants and 6 servi. 1279 – Hatfield Priory in Nosterfield owned 38 acres of wood know as Goodwood, situated in the south eastern corner of the parish. It covered 31.5 acres in 1793 but had probably been cleared by 1799. Extract from ‘Magna Britannia – Cambridgeshire’ by Daniel & Samuel Lysons, first published 1808. SHUDY-CAMPS, in ancient records, called Shudee-Camps, and Scode-Camps, adjoins to Castle-Camps, being 14 miles south-east of Cambridge, and about 13 south of Newmarket : it was sometimes called Parva-Camps; and appears to have acquired its present name form the family of Shudee, who, in ancient times, possessed the manor, and gave the hamlet of Northoe to the monks of Ely. The manor of Shudy-Camps was held by the family of Hanchet, in the reigns of King Edward I. and King Edward II. of the family of Playz, as heirs of the Montfichets : at a later period, it was successively in the families of Cholmeley and Bentley : it is now the property of Marmaduke Dayrell, Esq. In whose family it has been ever since about the middle of the seventeenth century. The manor-house, now the seat of Mr. Dayrell, was built by his grandfather, Sir Marmaduke. The manor of Shardelowes was conveyed in the reign of Edward III. by the abbot and convent of Waltham Holy-Cross, to John Shardelowe, Joan his wife, and Thomas his brother, in exchange for manors in Essex ; it is probably the same that was given (by the name of the Manor of Shudy-Camps,) by John Methwold, and others, to the master and chaplains of a chantry at Thomeston, now Thompson, in Norfolk. Subsequently to this, there have been two manors called Shardelowes Mynotts, and Shardelowes Alingtons; the former was for many years in the family of Bridge, from which it passed by marriage to Huffey, and after an intermediate alienation, was purchased in 1801 by Mr Dayrell. 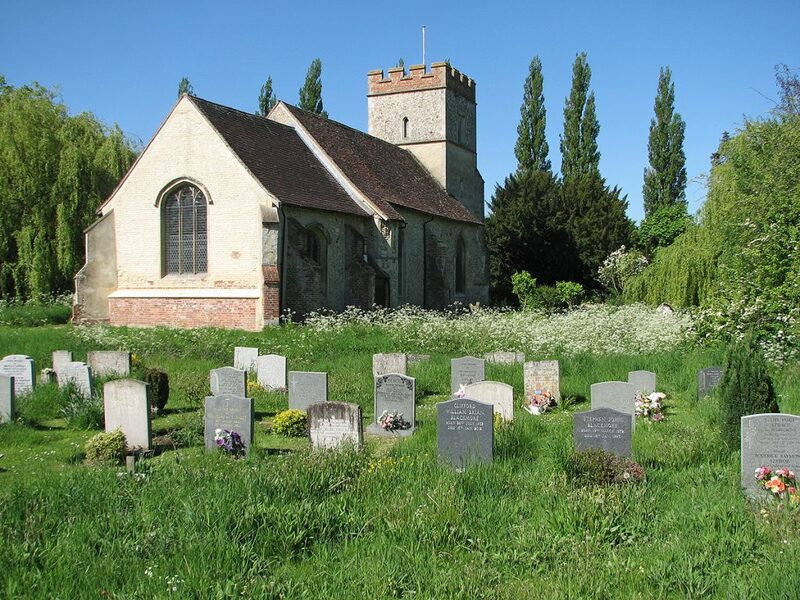 Shardelowes Alingtons, which it is probable belonged to Lord Alington’s family, has passed by inheritance, with other Cambridgeshire estates, from Charles Duke of Somerset to the Earl of Aylesford. In the reign of Queen Elizabeth, Thomas Higham, Esq. had a manor in this parish called Jaques, and a capital messuage called Mascalls. The Manor of Nosterfield-Priors, which was given about the year 1230 to the priory of Hatfield-Regis, in Essex, by Robert Earl of Oxford, is now the property of Mr. Dayrell, having been purchased by his father of Lord Leigh. Nosterfield and Northoe are two small hamlets belonging to Shudy-Camps : Northoe is held by Lord Aylesford under the Dean and Chapter of Ely. In the parish church are some monuments of the Dayrell family. The rectory, which had been appropriated to Waltham Abbey by Julian, daughter of Jeffrey de Sude-Camps, is now vested in the master and fellows of Trinity College in Cambridge, who are patrons of the vicarage. It appears, by the returns made under the act of parliament for ascertaining the population of this kingdom in 1801, that there were 51 houses in Shudy-Camps, of which all were inhabited; the total number of inhabitants, is stated to be 349,living as 59 families.